A few days ago I spotted an awesome RAM deal on HotUKDeals, Amazon UK were selling 16GB of Corsair Vengeance low profile (2 x 8GB) DDR3 1866 Mhz for only £83.57 inc VAT + delivery. My order was placed at the right time so it seems, as according to Amazon price checker camelcamelcamel £83.57 is the lowest price recorded. I already had a set of this RAM lying around, so ordered two more kits for a total of 48GB (6 x 8GB modules). 24GB is the official maximum supported RAM for the X58 chipset, but after reading online about some success stories with 48GB I thought it was worth a shot. Popped the modules in my Gigabyte GA-X58A-UD3R Rev 2.0 and can confirm it runs as sweet as a nut. 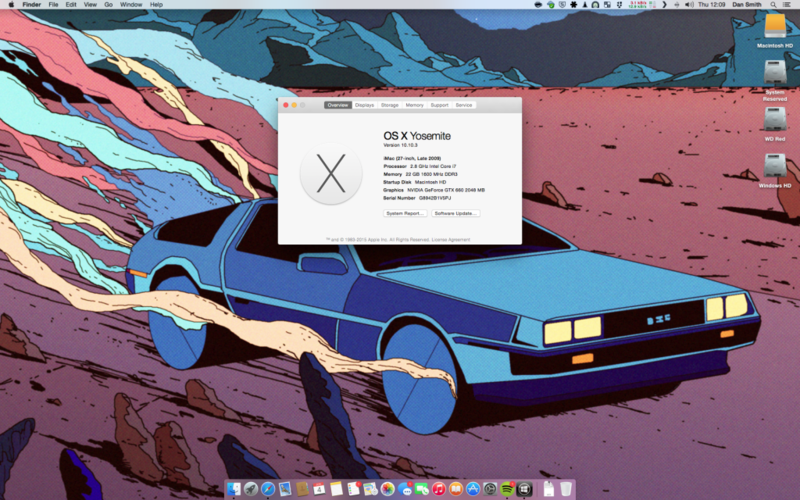 OS X Yosemite recognises the full 48GB and all 6 modules correctly, with no issues reported so far. After many years of running the Chameleon boot loader, the time has come to climb Hackintosh ‘Everest’ and make the transition from Chameleon to using the Clover project boot loader. Like Chameleon Clover is a boot loader that allows Mac OS X to run on non-Apple hardware, however it is meant to bring numerous benefits and fixes over the former solution. From reading forums online and after several previously failed attempts I don’t expect this to be an easy task, but this time I am determined to get it working. Clover is labeled as real EFI and Vanilla than Chameleon. Apple for one reason or enough has recently spruced up their security and services that used to run fine; like iMessage, no longer work. More commonly sleep has historical always been a sore spot for Hackintosh’s. Clover claims to alleviate most of these issues, only time and effort will tell. The installation kept freezing upon launch in Clover, after some reading I realised it was linked to the USB 3.0 controller. After disabling the USB 3.0 controller installation proceeded without issue. I will re-enable support at a later date and see if the controller still causes problems. After a lot of reading online and testing different configurations I managed to get a working system booted, but my experience wasn’t as straight forward compared to other peoples from what I can tell. I followed steps 1 to 3 from TonyMac’s guide clover guide. I then created a UniBeast USB in order to boot the freshly installed system, as for the life of me I could not get the system to boot using a USB installed with Clover. Once booted into the system I downloaded the latest version of Clover and began the installation process, which is similar to step 4 from TonyMac’s guide. Once installed I rebooted the system, removed the USB and was gladly presented with the OS X boot screen, Happy day! My Nvidia 680 GTX is natively supported, therefore I did not enable the Nvidia inject option. Audio I got working using the usual method of Multibeast, I haven’t had any luck with getting it working using any of the alternative Clover methods yet. Either way I’m glad it is finally working.